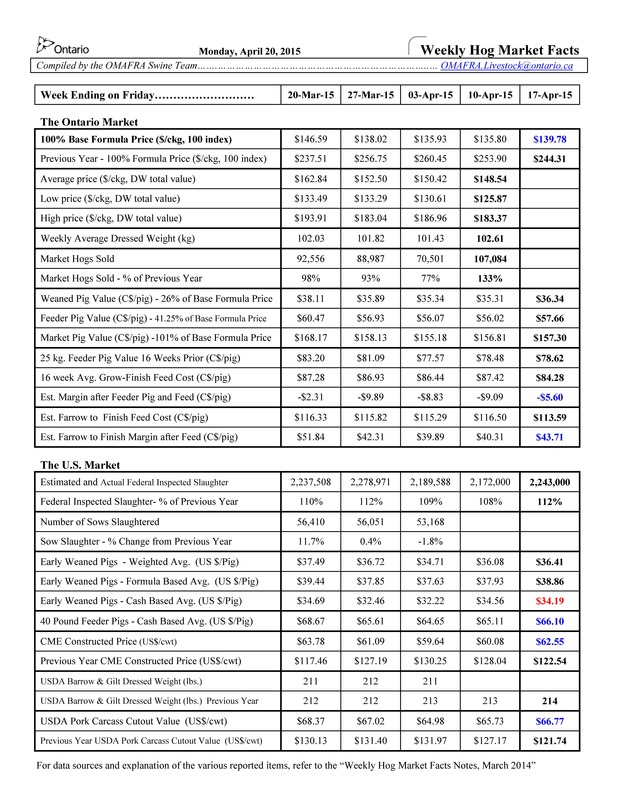 Monday April 20, 2015 Weekly Hog Market Facts. • The Ontario Base Market Hog Price is averaging $182.33ckg, 100 index, up by $0.55/ckg from last week’s average due to a weaker Canadian dollar which is down 0.48 cents to 87.96 cents. The CME Constructed weekly average price of US$88.60/cwt. is down US$0.21/cwt. from last week. • The USDA Pork Cut-out Value is averaging US$92.68/cwt. which is down US$0.20/cwt. from last week’s average with loins, bellies and ribs up and the other 3 primals down. • US slaughter has averaged 2,152,243 the last three weeks but remains 4.3% below last year for the same weeks. Dressed weights moved to a 212 average which is 2 pounds above the same week last year. • Ontario market hog sales year to date continue to be up 2.5% over last year. First quarter sales were up 2%, second quarter up 5% and third quarter is up 2.8%. Fourth quarter sales to-date are slightly under with last year. The weekly average dressed weight continues to be above 102 kg. • Current daily movement in the pork cut-out, narrower packer margins, cash price and nearby futures along with the expected seasonal trends, indicate next week’s price movement will be sideways. • CME Constructed Price – US$88.74/cwt. The Ontario Base Market Hog Price is averaging $244.44/ckg, 100 index, down $6.75/ckg from last week’s average. This is based on a CME Constructed weekly average price of US$123.29/cwt. (down US$4.09/cwt. from last week) and a Canadian dollar weekly average of 91.46 cents (down 0.51 cents from last week’s average). CME Constructed Price – US$121.53/cwt. The USDA Pork Cut-out Value is averaging US$127.13/cwt which is down US$2.60/cwt. from last week’s average with all primals down except for bellies . 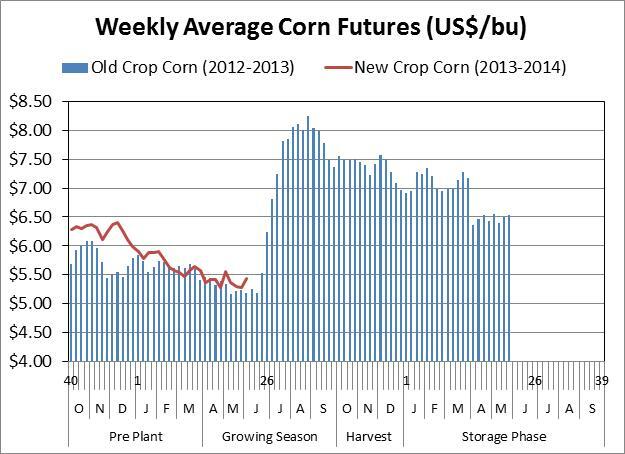 As of today (Thursday), the above numbers would indicate that the weekly average price could decline again next week. So far this week the Ontario Base Market Hog Price is averaging $251.94/ckg, 100 index, down $4.64/ckg from last week. This is based on a CME Constructed Price weekly average price of US$127.89/cwt. (down US$3.63/cwt. from last week) and a Canadian dollar weekly average of 92.06 cents (down slightly from last week). 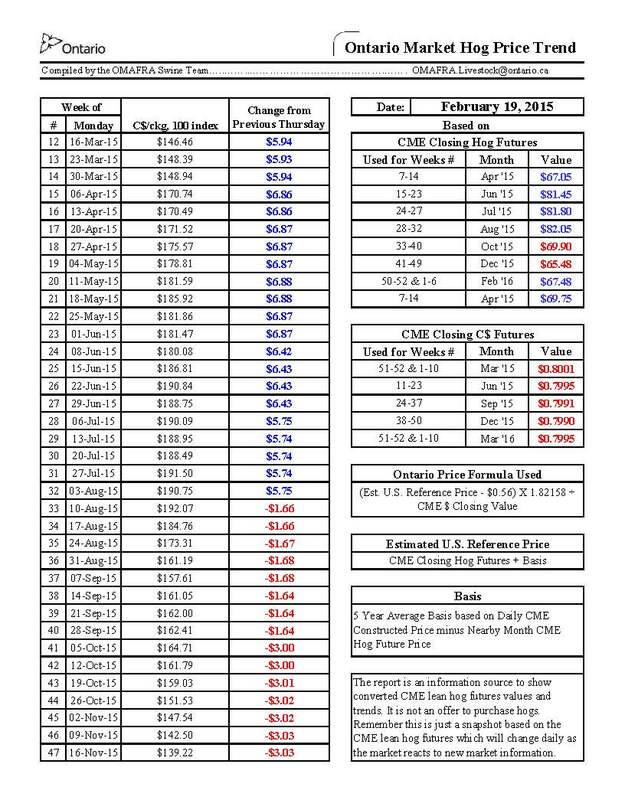 • CME Constructed Price – US$126.29/cwt. The USDA Pork Cut-out Value is averaging US$130.33/cwt which is down US$2.58/cwt. from last week with all primals down except for hams. 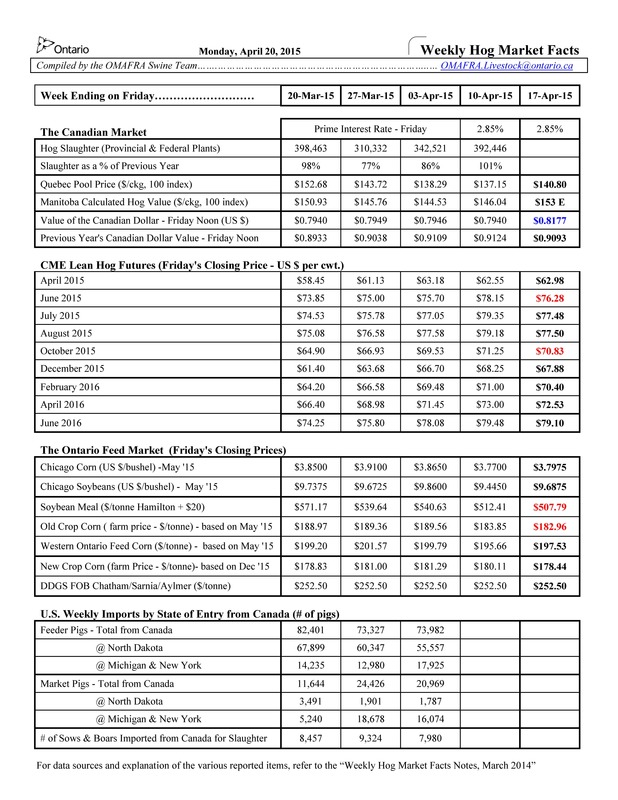 To subscribe to receive the Ontario Market Hog Price Trend Report email John Bancroft.